Everyone’s home style is different and yet it seems modern decor is creeping into everyone’s homes in one way or another, especially in lighting. 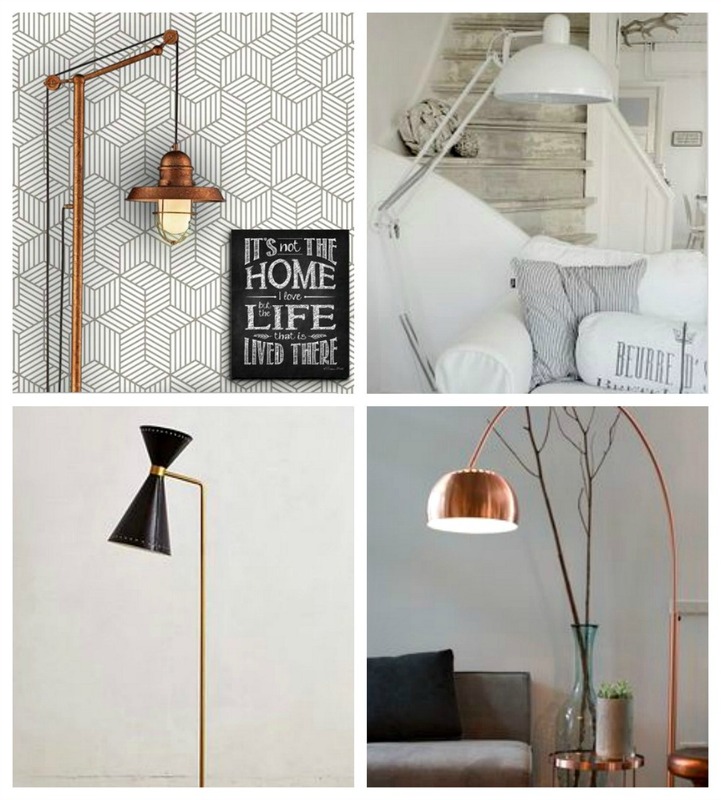 While my home is more of a shabby chic design, I am drawn over and over to modern lighting and geometric shaped lamps and gold and copper tones. I can just see an excuse to redecorate a room rising. Hanging lamps are on trend now and the modern options are absolutely endless. I have selected these four which I think I could really incorporate into my existing home decor. I would love my breakfast bar to have these gold ones in the bottom left hand corner. I think they are just stunning. If you know me or my blog long you will know I am in love with grey, yellow and white combination of anything so the bottom right ones are lush. I could put anyone of these in my home. Just changing your lighting can really change a look of a room and can even be your main focal point if you are brave enough to get trendy and modern. I have longed for a dream office and a space to call my own. One day I will get there until then I have been drooling over what I would want that space to look like and especially these gorgeous desk lamps. The first top one is by far my most favorite. I envision a desk quite similar to the one it stands on. A lamp can really add color and design to a desk. 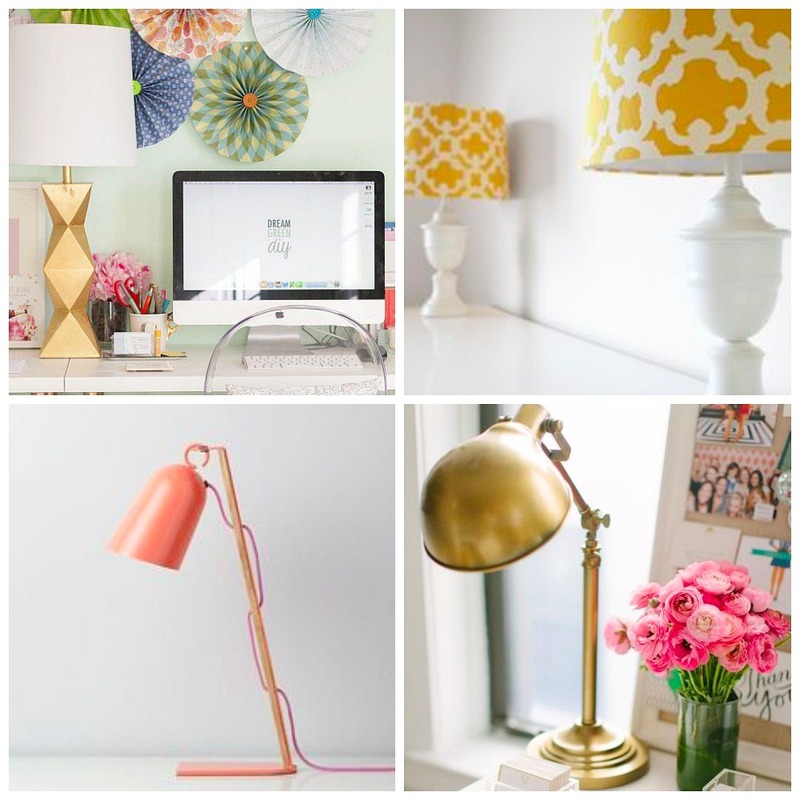 I have always leaned towards an all white desk too so vibrant funky lamps are a must to pull the design together. I can spend hours on pinterest just peering over various lightings. I never used to have floor lamps in my home. I guess because I really never had a use for them. It was something that I started looking for when I started decorating our new house so that I could cozy up and read a book without the main light being on. Maybe it was a turning 30 kind of home decor item, I am not too sure. I love copper and gold tones and I think next to white walls they can really pop as well as add funkiness to a room. They are so many various designs depending on what you would use it for and what room it will go in. It could be for your hallway next to a sideboard or next to you on the sofa. I think with a floor lamp the more modern and funky the better no one wants to be reminded of Grandma’s old lamp shade in the corner! Do you like modern lighting? Follow my pinterest board below or leave a comment on which style of lamp is your favorite, as I will be looking and pinning more soon would love to know what you think. Follow Let’s Talk Mommy’s board Modern Lighting on Pinterest. Sometimes that is what works old meets new. Maybe try modern but rustic vibe so it matches. Hallways can be revamped into anything. Thanks for following me on pinterest. I could seriously get lost in there. Thank you so much. Sometimes I can make better mood boards than putting it all together in my own home especially as I have two little ones I can’t do much yet. Hahaha gathering ideas for the future. Thanks hun. I am obsessed with home decor. I need to move just to decorate again. My style changes all the time. Ooo I’m loving the copper lights too such a modern yet quirky feel to them!! The 4 hanging copper ones are particularly dreamy!!! The four copper hanging ones are on my top must figure a way to put them in my house list. hahaha I am loving copper and golds this season. I actually love the lighting you have chosen! I too have a thing for lighting and I am just about to actually sign a sales agreement with a lighting company to sell their home products. I will send you some pictures when I have.. Good post! Love it! Thanks. I am a huge fan and would love to change some of the lighting we have going on in this house. Sounds like a good contract to sign up with for home products. Thanks for stopping by and commenting. Me too, it changes the look too and I am in love with them now. Glad you like my featured ones here. I am the same until the kids are a bit older and stop breaking everything I can’t really go mad with it just yet. But I am dreaming with all of these and more on my pinterest board. A girl can hope! Hahah I like the trendy club idea made me chortle. I am always heading to the lighting section of stores first. Love it. I would love more natural lighting in my house too. One day my forever home will just be all windows!!!! Yes I am itching to redecorate something although I have only just finished all the rooms in the house. lol I told my husband we need to move hahaha It would be hard for me to choose too! Love them all. Mine too, I would definitely have to wait until my two are bigger before I start getting trendy with feature lighting and lamps but I love to dream of these. Thanks. Oh I do love a big statement chandelier for sure. We have a large one that hangs from upstairs to downstairs and it’s my favorite too! I think I would just have lighting everywhere all the time. We’ve recently moved and I’ve been looking at lighting. I love number 1 in your hanging lights. Will pop over to your Pinterest for a nose! Thanks Lucinda. Happy lighting gazing. I got lost in pinterest for a few hours making my board. So many beautiful options. Oh me too, I am very fond of anything yellow, grey and white, if you couldn’t tell by my blog. It’s nice to dream through the window shop sometimes too though! Sounds lovely. I know me too. I have always loved them but yet to put them with my decor. Trying to do that now as they are so trendy this season. Especially golds and copper ones. I love these choices! They’ve popped up in my pinterest feed as well and I’ve been fonding over them since. I think I would have to agree with you and pick the lamp for the office as my favorite. I love that whole room, actually. With the white dress, the gorgeous paper latern backdrop and that clear lacquer chair–it’s very modern and chic at the same time! Thanks for these choices! Oh yes I couldn’t agree more Maria. I want the entire room for sure. It’s stunning and my dream office. I don’t have a work space really so would love an entire office. Lol greedy I know. A love the desk lamp with the geometric base. It’s such a unique piece. I never really gave much thought to lighting, but it really is a simple way to transform the look of a room. Oh yes lighting can completely change a look to a room. Bring in shapes and Colors too. Love these, especially the copper ones! We have been looking for a decent one in our dining room for a while so will def be checking those out. Also completely agree having floor lamps is an over 30 thing – I never had one until recently! Hahaha it really is. Glad I am not the only one. 30 changes so much in our lives. Lol The copper ones are my favorite. I love a good pendant lighting for dining rooms. Those are great pics! I can’t wait to get to a point where I can choose the things I surround myself with in my home, rather than going with whatever we wind up with through hand-me downs and gifts! Thanks Brandyn. Oh we all live that stage of life too. At the moment I am in a children break everything phase so nothing nice or new is coming in this house anytime soon. No I will have to watch it. Thanks hunny, I am lighting obsessed there never seems to be enough in this house! Oh yes she will be in eight more days I can’t wait. Oh I get lost in pinterest for hours. I like the metal frame hanging light particularly. The only problem with hanging lights is not forgetting that they are there. I’m always banging my head on then one in our dining room, if I happen to lean over to pass something to someone on the other side! Oh no. That’s never good. I do like them but can imagine they get in the way for sure. Exactly my problem. I want to now change all the lights in my house. Hahaha I am a little obsessed. Thanks Carolyn. Those are definitely top of my list. Beautiful. Oh I love when it’s a timely post. I had one from another the other day. It was great. Oh place in France take me with you. Thanks Sabrina. I think so too. But as you can see grey and yellow are my Favorites all the time. Hahah been my blog Colors from the beginning. I LOVE those copper hanging lights! They wouldn’t go in my house unfortunately but I do still love them! I recently got myself a floor lamp, similar to the arch one in your picks. I love it, just adds interest to a room doesn’t it? I agree that changing just one key thing like lighting can change the look of the entire room. I do love the hanging ones! PS. I too dream of a room of my won or at least a desk! Thanks Jess. I really would love that too. Wishful thinking for now. Yes I would love them over an island thought the same too. Thanks hunny. Lovely lighting choices! 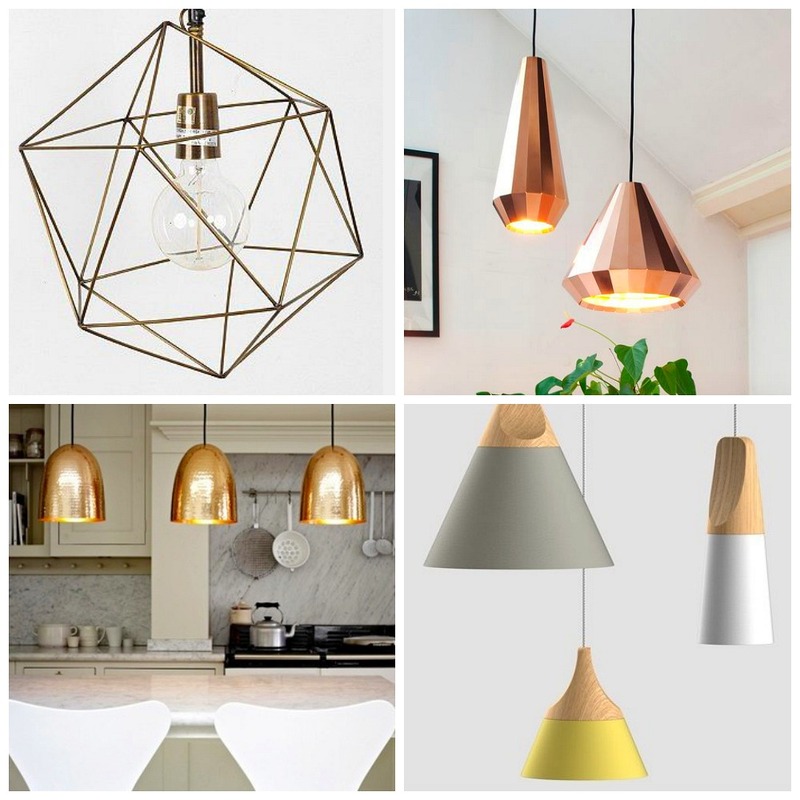 I have similar pendants in my kitchen and a great leaning floor lamp! We are considering moving again and I think I just love to decorate! I know I do and I would move house just to decorate again and again. Love pendant lighting. Thanks Louise. It’s so hard to choose which ones I want and where to put them that will make them pop and be focal points. I just am day dreaming on pinterest lately. Love the bronze hanging lamps they would look so good in my lounge hmm you now have me looking for new lampshades we have rather gross ones up from when we moved in a couple months ago! I have been doing the same, going around my house looking at what lighting I can change and it almost makes a whole room feel new again. Glad you like. Thank you. Nothing wrong with traditional that’s why it’s traditional because the style never fades. Always a great classic to live in. I love your choices… such great designs. I am partial to a floor and desk lamp. They can really make a difference and pieces of art in their own right! Most definitely. I love a statement lighting. I always say the same. I stick to traditional because always too nervous but lately trying to branch out. Thanks Jen for hosting and stopping by. Perfect timing! I am looking for some new lights in our living/dining room! I need to get you round I think!!! Hahaha thanks hunny. I love lighting and it can change a whole room depending on what you choose. Good luck and happy light shopping. Oh yes me too. Breakfast bar is on my want list and definitely with hang lighting. Lol low lighting is so relaxing too. Going to bookmark this page for when we eventually move out of rental and buy our own house. Might help me show my husband what I have in mind as he has zero appreciation for lamps (he’d live under floodlights if he could!). I have to avoid lamps in my house because the twins just break them. Love the yellow table lamps featured above though. Thanks Emma. I am the same with my two toddlers but I can dream about them one day. lol I have been drooling over them on Pinterest forever. haha Thanks Anna, I know what you mean I am the same can’t wait till the kids are older and I can decorate with whites and neutrals again. 🙂 Bright and airy is the best. I’ve loved the wire pendants for ages but found them to be really costly. Hopefully now that they’re gaining some popularity there will be some most affordable versions on the high street so I can buy one yay! I think the price will start to come down on them as they get more and more popular and other shops start carrying them. I would love to have them in my house.